When Michipreneur began in 2012, it was a blog focused on telling stories from Michigan’s startup community. Since then, it has grown into a full-on digital publishing operation that offers a host of online services for local startups. 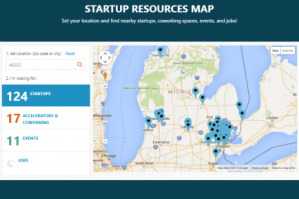 This week, the company announced it has launched a new platform connecting Michigan entrepreneurs and creatives across the state to resources like job postings, events, and classes. Amanda Lewan, who founded Michipreneur as a graduate student at Wayne State University and still oversees it today, said she hopes the growing online publication will serve as a resource for all small businesses across the state. Lewan said she decided to make her site more interactive after looking at what other entrepreneurial communities were doing, particularly New York and Chicago. “I wanted all the resources available to entrepreneurs to be up front, and for people to still be able to see all the [startup] stories,” she explained. Lewan said the sheer scope of the different kinds of ventures people are starting is why Michipreneur doesn’t limit itself to covering any particular segment of the startup population. She also singled out grassroots entrepreneurial programs like FoodLab for helping to pique local interest in trying to build small businesses. “There are all these great organic communities popping up,” she added. Michipreneur also has a jobs board, which charges users a fee if they want to post a job, but is otherwise free to access. Lewan worked with another rising local startup, Momentum, to create the Michipreneur site’s new design. Lewan said Michipreneur has posted stories about more than 300 companies since its inception, and she’s thrilled with the ongoing growth of Michigan’s startup scene. She almost moved from Detroit to Chicago after grad school, but she decided to stick around. “All the activity inspired me to stay,” she said. Michipreneur is still headquartered at Bamboo Detroit—where Lewan is a partner in the co-working space, as well as its “chief storyteller”—and the site’s author roster has grown from just Lewan to six contributors from around the state. But above all, Lewan wants Michipreneur to be an open platform where entrepreneurs—especially those who are new to town and may not know where to start—can connect to resources, jobs, and each other.